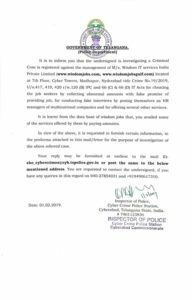 Attached is the notice i got from telangana police cyber crime dept. Investigating the scam in which wisdom jobs looted 70 crores mostly from middle east region. Cheated me by making fake paid job offers while i lost my job in uae. I paid $1350 for a job in an mnc which does not exist in the organisation they offered me. Conducted online competitive evaluation test and telephonic interview while i was in uae, telephonic interview was taken by irwin joy as hr head.